North on 101 past the 2 Healdsburg exits to the Dry Creek Road exit. At the exit, bear right on Dry Creek Rd to the stop light which is Healdsburg Ave.
At Healdsburg Ave go left to the 2nd light which is Grove St.
At Grove St go left. 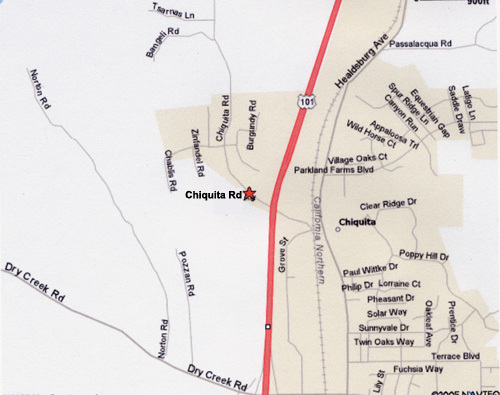 Go over the railroad tracks and bear right on Chiquita Rd. Go under the freeway and we are the 2nd driveway on the left. We are very close to the freeway overpass. Drive in....the slaughterhouse is on the right.